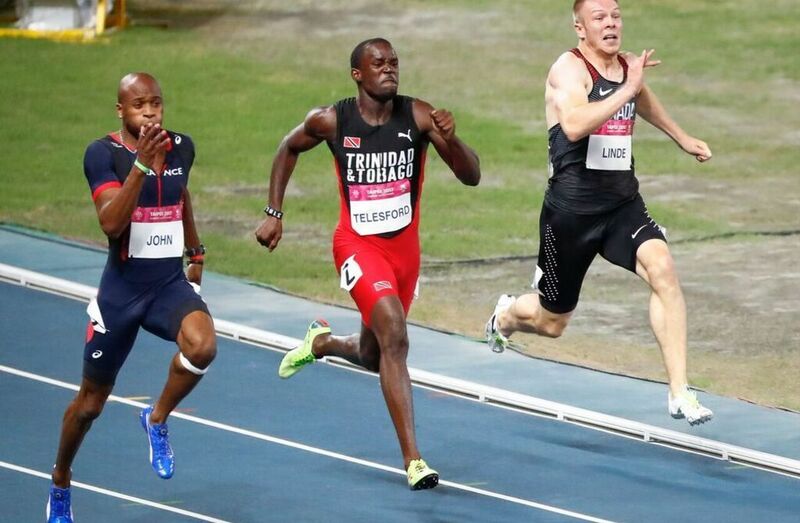 Canada reached double digits in medal count on Saturday, Day 8 of the Taipei Universiade, courtesy of sprinter James Linde who crossed the finish line of the 200m in second place. Team Canada's women's water polo team dropped a tough quarter-final match against the USA on Saturday night. Defeated by a score of 13-7, the red and white will move on to the classification round for 5th-8th place. "We started off great in the first couple minutes. We had some great offence and great defence, but we got a little undisciplined on some mistakes on counter attack and some decisions we cannot afford to take," said head coach David Paradelo. "That backfired on us and then playing the comeback game against a team as solid as the USA was tough." Elyse Lemay-Lavoie led Canada with three goals in the match, followed by teammate Emma Wright with two. Six different players for the US scored two goals each. "We're going to give it all we got in the last couple games of the tournament. I think we deserve to be in the top four, but a bad game versus Japan cost us a lot in terms of seeding and now we're going to work hard to get fifth place," commented Paradelo. Canada will face Italy on Monday in their first classification game. After losing their quarter-final match to host Chinese Taipei, the Canadian women’s basketball team lost 80-75 to the U.S.A. in their 5-8th place classification game. Paige Crozon led the team with 15 points, while Abigail Fogg was two rebounds short of a double-double with 10 points and eight rebounds. Canada will now face the Czech Republic on August 27 at 10 p.m. Eastern time in the 7-8th place game. Danielle Brisebois led the Canadian women’s volleyball team with 10 kills and a block in Saturday’s 3-0 victory over Mexico in their 13-16th place classification match. They will now play Latvia on August 27 at 3 a.m. Eastern in the 13-14th place match. At the same time the men will also be in action against Romania in 9-16th place classification match. Another heartbreaking loss for Canada's women's soccer team came today in the 5th-8th place classification match. The red and white went scoreless with Korea for a full 90 minutes, before taking the game to a shoot out. Canada was unable to come up with enough goals to win, as Korea scored four penalty shots to Canada's three. The women's soccer team will play for seventh place against Mexico on August 28. On the final night at the Taiwan Sport University Arena, Canada didn’t find the podium in its two finals. Kennedy Goss finished eighth in the women’s 400m freestyle final with a time of 4:13.88. The following race featured the women’s 4x100m medley relay. Canada’s team was made up of Alexia Zevnik (backstroke), Kelsey Wog (breaststroke), Katerine Savard (fly) and Jacqueline Keire (freestyle). They finished fifth with a time of 4:03.99. In the only final of the day at the diving pool, Canada's Ashley McCool finished the competition in fifth place. Earlier in the afternoon Tyler Henschel qualified in eighth position for the men's platform final scheduled for August 27. Henschel will have a busy Sunday as he is also slated to compete with teammate Celina Toth in the mixed team event to round out the diving competition. The taekwondo competition wrapped up today with Team Kyorugi. The women's team dropped their bout to Russia by a score of 24-11, while the men's team was unable to take down Korea, losing the bout 32-28. On the golf course, round three is in the books at Sunrise Golf Club. The men's team sits now in eighth place, with Austin Ryan leading the way individually with a +1 score, the 18th best of the competition. The women’s team is now in 13th place, while Mu Li is having the best performance so far, sitting in 31st place. It was a busy day of singles action in table tennis on Saturday and four Canadians advanced to the Round of 32. Anqi Luo won her final pool play game 3-0 to move on while Lester Lee won a thriller 3-2 to advance out of his group. James Pintea and Klement Yeung are also through to the Round of 32 which is scheduled for August 28. The Wushu competition began in Taipei today. Megan Tsang finished seventh in Taijiquan with a score of 8.60, while Jordan Branker lost to Turkey's Yavuz Kazanci in a men's Sanda 80 Kg preliminary bout. The Changquan category, as well as the Nanquan and Nangun category compete tomorrow.